Starring: Jack Benny, Ellen Drew, Eddie ‘Rochester’ Anderson, Andy Devine, Phil Harris, Dennis Day. 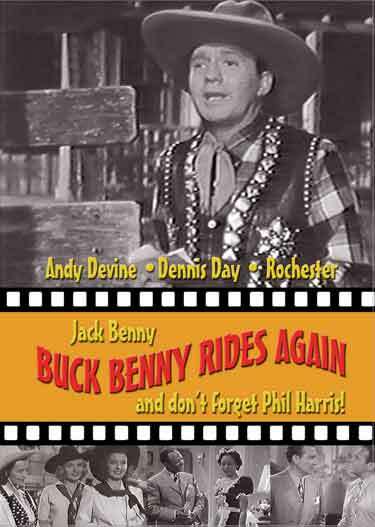 Radio star Jack Benny, intending to stay in New York for the summer, is forced by the needling of rival Fred Allen to prove his boasts about roughing it on his Nevada ranch as Buck Benny. Meanwhile, singer Joan Cameron, whom Jack’s fallen for and offended, is maneuvered by her sisters to the same Nevada town. Jack’s losing battle to prove his manhood to Joan means broad slapstick burlesque of Western cliches. 1940 – BW – 82 Minutes. This entry was posted in Nostalgia Merchant and tagged DVD, Rare Classic Movies. Jack Benny..